Chickens come in all sizes! 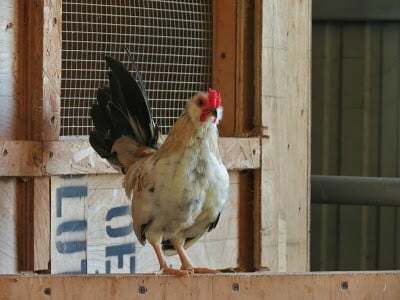 When most people think about chickens, the image in their mind is usually of a large, heavy looking bird, which are the standard breed varieties of chickens. But there are also miniature or bantam varieties. Bantam isn’t a specific breed, but rather a smaller variety of poultry. These birds can be as small as 1/5 the size of a standard breed. Some bantams are simply the smaller version of a standard breed – for instance the Rhode Island Red has both a standard and bantam variety. But other breeds, like the Japanese or Sebright, are only found in the bantam variety. There is nothing genetically wrong with the birds of this variety – they are simply the miniature version of chickens, as also seen in dogs and horses. Their eggs are considerably smaller as well, but it usually takes two to equal a standard egg (¼ a cup = standard egg) when cooking. Many people enjoy the smaller eggs as a hard-boiled snack, and others just enjoy raising a smaller breed on their farm.